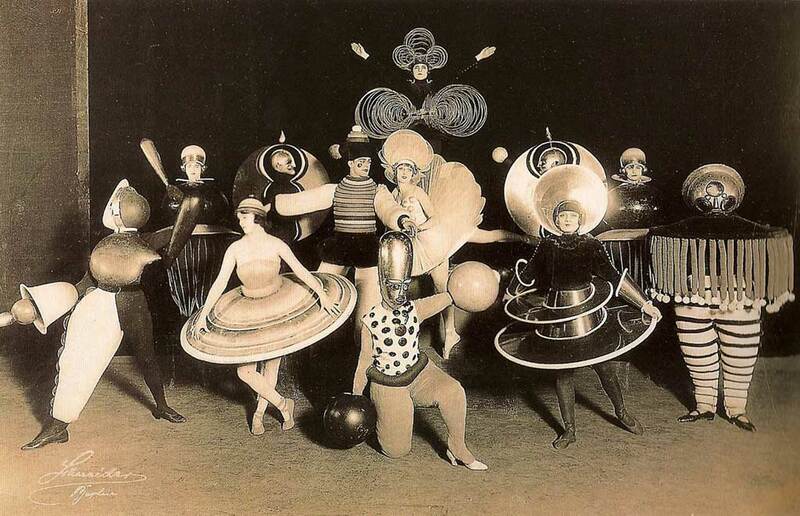 Oscar Schlemmer: Triadic Ballet, Bauhaus 1922 Ideas of the gesamptkunstwerk – the total art work – drove both Walter Gropius (founder and director of the Bauhaus), and Lazlo Moholy Nagy, who in 1923 took over as head of the Preliminary (Foundation) Course from Johannes kitten. Oscar Schlemmer had his ideas too, inspired by von Kliest’s essay on the Marionette Theatre (1798), and concurring with Moholy Nagy’s vision of a theatre of machines. Examples of indicators of the emerging Cinema of Totality. The Wachowsky’s The Matrix (1999) in many ways mapped out the new ‘virtual cinematography’ – the intricate compositing of live-action-motion-capture-CGI, freeing the camera both in space and time. I believe that we are witnessing the early stages of a Cinema of Totality. Very early stages, I suggest, as the true art of the 21st century is still only being hinted at in the great variety of emergent art-forms and media innovation that has marked the last twenty years. These nascent forms include interactive installation-art, augmented reality, virtual reality, e-books, web-sites, virtual worlds, projection-mapping, webcasting, geographical information systems, social media, fractals, CGI, robotics, simulation software, chatbots, machine-generated literature, games, MMORPGs, hypertext and hypermedia, multi-touch, gesture recognition, speech-recognition, machine-learning, video-art, artificial life, genetic algorithms, QR Quick-Response Codes, hologram projection, tamagotchi, exoskeletons, transmedia narrative, synthespians, software agents, Internet of Everything, wikipedia, internet archive, Skype, animatronics, interactive documentary, digital journalism, realtime motion capture, PreViz software, – and of course a swath of acronymic technologies, including: html, vrml, RSS, PHP, Java, CCTV, HD, QTVR, VVVV, RFID, GPS, GIS, etc. Some key books have hinted at the possibilities here: Brenda Laurel: Computers as Theatre (1991), Howard Rheingold: Virtual Reality (1991), Clifford Pickover: Computers and the Imagination (1991), Steven Levy: Artificial Life (1992), Neil Stephenson: Snowcrash (1992), Noam Chomsky: Manufacturing Consent (1992), Scott Bukatman: Terminal Identity (1993), Howard Rheingold: The Virtual Community (1993), April Greiman: Hybrid Imagery (1993), Kevin Kelly: Out of Control (1994), Bob Cotton and Richard Oliver: The Cyberspace Lexicon (1994), Robert Pepperell: The Post-Human Condition (1995), Sherry Turkle: Life on the Screen (1996), Mitchell Resnick: Turtles, Termites and Traffic Jams (1997), Janet Murray: Hamlet on the Holodeck (1997), Bob Cotton and Richard Oliver: Understanding Hypermedia 2.000 (1998), Hans Moravec: Robot (1999), Scott McCloud: Reinventing Comics (2000), Bob Cotton and Malcolm Garrett: You Aint Seen Nothing Yet (2000), Jay David Bolter: Remediation (2000), Brenda Laurel: Utopian Entrepreneur (2001), Lev Manovich: The Language of New Media (2001), Martin Dodge and Rob Kitchin: Atlas of Cyberspace (2001), Lucien King: Game On (2002), Bob Cotton: Futurecasting Digital Media (2002), Howard Rheingold: Smart Mobs (2002), Jeffrey Shaw: Future Cinema (2002), Bill Moggeridge: Designing Interactions, Charlie Gere: Art, Time and Technology (2006), Stephen Keane: Cinetech (2007), Mike Faulkner: Audio-Visual Art and VJ Culture (2008), Jesse Schell: The Art of Game Design (2008), Erik Brynjolfsson and Andrew McFee: The Second Machine Age (2014), Lev Manovich: Software Takes Command (2014). While most of these example films are blockbusters, and several are series (to amortise the original costs over several films), around 30% of the top 100 greatest grossing movies would fit in as illustrations of the totality of directorial freedom in the last decade or so. If you can imagine it, we can build it. These were all hints as to the essential building blocks of a 21st century iteration of Wagner’s Gesamptkunstwerk (composite art work) – hints as to the ingredients of a new total art form. But I want to talk about a recent trend apparent in big-budget (blockbuster) movie-making. A trend that has several signs of a new Cinema of Totality. In the last decade or so, it is computer graphics modelling and animation (CGI for short) that has catalysed this creative freedom – allowing director’s, production designers and cinematographers the freedom to think and to create entirely outside the constraints of gravity and space/time. From the very first high-level CGI I saw in the early 1980s (it was a much treasured showreel from John Whitney Jr’s Triple I studio) it was obvious that this was not only part of the future of animation, but an essential component in the future of movies. Of course, CGI wasn’t a sudden phenomena – on the contrary, the art and science of computer graphics has a long history – with its foundations in the work of the MIT Lincoln Lab (light pen 1958), Boeing Aircraft Company (3d wireframes) in the early 1960s, and its breakthrough-moment came with the work of Ivan Sutherland and his 1963 doctoral hypothesis: the Sketchpad software (interactive, screen-based 3d modelling), and the work of the flight-simulation company he set up with David Evans (Evans and Sutherland) in 1968. This is hardly a definitive list, but it gives some impression of the phenomenal development of computer graphics over the 54-year period: 1960 – present. The components of CGI – the hardware and software – are of course still developing. The software is a fascinating example of the success of the scientific collaborative sharing of knowledge aka the open-source ideal. The software packages used in the industry now (Maya for example) are the result of over 50 years of innovation by computer scientists, artists, CG specialists, and graphics programmers. The gradual accretion of algorithms for modelling and rendering is a phenomenal example of international collaboration, and has resulted in a set of immensely powerful tools for film-makers, (as well as for artists, architects, designers, scientists, medical researchers, etc, etc). A scene from The Matrix – the universe of options echoes the range of potential techno-aesthetic components of the cinema of totality. In this brief mapping of the trendings towards a Cinema of Totality, a few zeitgeist concerns resonate through the last 11 decades or so. One is immersion – the desire to surround an audience with light/sound /visuals/scenographics/information/signals/signs/meaning – another is interactivity – the trending towards active artist-audience-artist dialogue, machine-dialogue, interpersonal dialogue, intermedia and transmedia dialogue. Another is non-linearity – a zeit-form iterating through 11 decades in the atonal composers, in James Joyce (especially in Finnigans Wake, 1939), and in William Burroughs (early 1960s), and in Dziga Vertov (Man With A Movie Camera, 1929). And in Maturana, Cybernetics (Norbert Weiner, 1947), in Psycho-geography (Guy Debord 1954), in T.S. Eliot (The Wasteland, 1922). The other main recursive strand is multi-media, intermedia, transmedia (a mixing of media – film, ballet, literature, music, dance, poetry, theatre etc etc), and finally a kind of synaesthesia – a mixing of the senses. These are the gradually evolving forms that will composite, catalyse and gell together into a radical 21st century art form, orchestrated by a student genius who gets it. Who gets the immediacy, the interlocution, the smartness, the genius, the richness of a form that marries sensory, kinaesthetic, physical, intellectual, algorithmic, lyrical and expressive modes of a form that is still being born, still nascent, still, like an unchecked lottery ticket, resonant with hope. We love it.